Christmas and the start of 2013 came and went in a flurry of activity. A few highlights from the holidays..
(Great) Grandma meets the newest addition to our fam for the first time. Our (almost) two month old grandbaby grew pigtails! One of my favorite scenes, the fam watching Christmas movies. The lights at Temple Square. Always a favorite. Jack enjoying chest deep snow on the (day after) Christmas storm. The day after Christmas it snowed and snowed and snowed. Snowy winter days are the perfect time to stay at home and (what else?) bake. This recipe came from an old friend in Spokane who baked loaves of Challah for neighbors on Christmas eve. 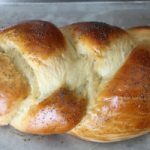 I’ve made this several times over the years, and attached few tips to help make your Challah making experience a little more user friendly. Challah is a delightfully chewy egg bread that is wonderful eaten alone or smothered with butter and honey. We love it for French toast. It takes a bit of time to prepare, but is worth every minute. 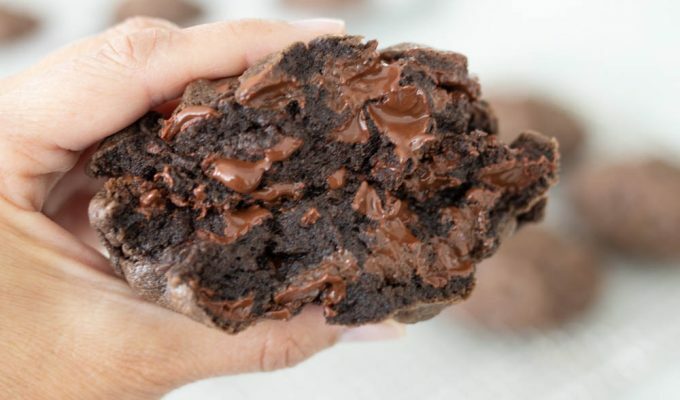 You may use a stand mixer for this recipe, if you do not have one, use a large bowl and mix with a large spoon. Place warm water, honey and yeast in a bowl and stir. Let sit until yeast starts to foam and rise up. Mix in 2 cups of flour. Stir well. Add 4 teaspoons sea salt and stir again. Pour in 1 cup vegetable or canola oil and 3 eggs. Mix until all ingredients are incorporated. Add the flour one cup at a time, until the dough loses its stickiness. This may take about 10 minutes. Read note about flour and how much to add. Remove the dough and place in a large oiled bowl and cover. Let rise for about 2 hours, punching down if needed. After the dough has doubled in size, punch down and knead. If the dough is sticky, knead in a little more flour to make handling easier. Divide the dough into two even pieces. Divide each portion of dough into three even pieces. Roll the dough into log rope-like strands and braid the pieces of dough to form a loaf about 15 inches long. Tuck the ends of the loaf under. Place the dough onto a greased pan, one loaf per pan. Brush with additional beaten egg and sprinkle with poppy seeds or sesame seeds if desired. Cover loosely and let rise for about 30-45 minutes in a warm place. Turn oven to 325 degrees. Place rack on bottom third of oven. When the dough has risen for the second time, place the bread in the preheated oven. Lower the temperature to 300 and bake for 50-60 minutes. The bread should be golden on the top and bottom of the loaf and be cooked through and not doughy in the middle. If the bread is not completely cooked, continue cooking for 5-10 minutes. -I usually make this bread around Christmas time. One mistake I've made time and time again is not allowing enough time for the bread to mix, raise and bake. It can be made and eaten in one day, but you need to allow about 6 hours before eating to make sure the bread making process is not rushed.-The original recipe calls for 8 cups of flour. I have not one time made this recipe and only added 8 cups of flour. Last week when I made Challah, I used a total of 12 cups of flour (2 in the initial mixing and about 10 in the second mix in). I use a stand mixer with the paddle attachment first (for about the first 5 cups of flour), then I remove the paddle and attach the dough hook to mix in the remaining flour.This will differ depending on your altitude, the weather, and the method in which you use to mix (food processor, stand mixer, or by hand). Add only a cup at a time and make sure the flour his mixed in thoroughly before adding more flour.-This is not a quick rise dough because of the large amount of flour, so be patient and let the dough have plenty of time to rise in a warm kitchen.-Be patient with the baking as well. Baking in a 300 degree oven allows the bread to bake more evenly and cook all of the way through. It may take a little more or less time in your oven.-Traditional Challah is woven into 6 strands, you may do this if you desire, I would still make 2 total loaves, just divide the dough in to six strand each instead of three. Looks like a wonderful Christmas! That cookie exchange is overwhelming! My brother usually bakes (and shares) his challah bread at Christmas; alas, this year he didn't. Maybe I'll have to give it a go. Love the great grandma and Annabelle pic….and the pig tails are so funny. This is beautiful bread Si. What a great holiday you had with your family. Happy New Year.